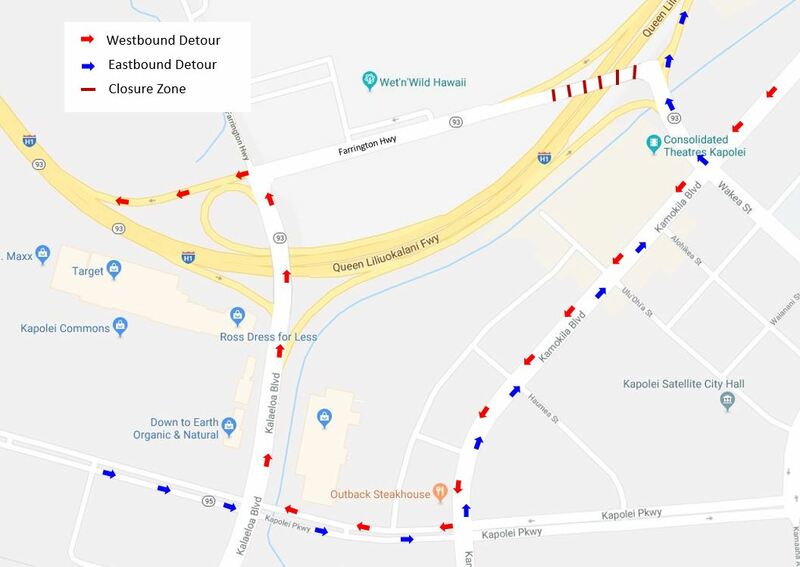 HONOLULU – The Hawaii Department of Transportation (HDOT) advises Oahu motorists of closures on Farrington Highway between Wakea Street and Kalaeloa Boulevard for the Kapolei Interchange Complex, Phase 2 project. All lanes will be closed in both directions on Sunday night, Jan. 7, 2018 through Monday morning, Jan. 8, 2018 from 9 p.m. to 5 a.m.
All ramps will remain open during closure hours. Westbound motorists will be diverted around the work zone via Kamokila Boulevard, Kapolei Parkway, and Kalaeloa Boulevard. Eastbound motorists will be detoured around the closure via Kapolei Parkway, Kamokila Boulevard, and Wakea Street. (See detour map below.) A full closure of the highway is necessary for concrete overlay work on the Farrington Highway overpass. In addition to the full closure, other daytime lane closures associated with this project are listed below. • Lane closure on the Farrington Highway between Wakea Street and Kalaeloa Boulevard on Tuesday, Jan. 9, 2018 through Friday, Jan. 12, 2018 from 8:30 a.m. to 3 p.m., for bridge deck work. Traffic will be contraflowed. • Left lane closure on the H-1 Freeway in both directions between the Wakea Street onramp and the Makakilo Drive overpass on Monday, Jan. 8, 2018 through Friday, Jan. 12, 2018 from 8:30 a.m. to 3 p.m., for median construction. • Right lane closure on the H-1 Freeway in the westbound direction between the Farrington Highway offramp (Exit 1E) and the Kalaeloa Boulevard overpass on Monday, Jan. 8, 2018 through Friday, Jan. 12, 2018 from 8:30 a.m. to 3 p.m., for overhead sign work.